...draws praise from her competitors for her expertise in the corporate sphere...and is known to be strong in transactional work, and peers say that "she is a good lawyer." 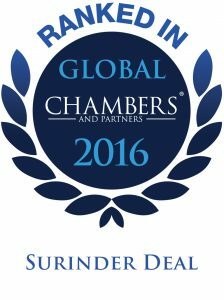 Surinder Deal is a Partner in the firm’s Commercial Transactions practice group. 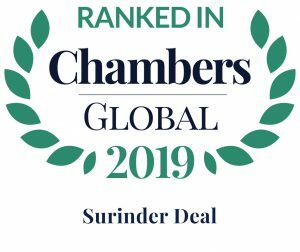 Surinder is an experienced practitioner in the areas of Corporate and Commercial Law, Banking and Finance Law, Real Estate Law, and Trust Law. For more than 31 years, she has represented clients ranging from small privately held companies to multinational companies in diverse industries such as banking and finance, manufacturing, real property development, hospitality, and gaming. She has served as lead counsel in a full range of general corporate and securities matters, including mergers and acquisitions, dispositions, debt and equity financing, business formation and structuring, joint ventures, public securities offerings and general corporate governance. Surinder provides advice and counsel to developers, lenders and borrowers on real property purchases and sales and collateral vehicles. Her representation of clients is also notable in the areas of applications for bank and trust company licenses and regulatory issues; finance transactions involving security over vessels; and trust matters. 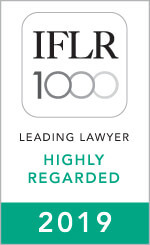 A former Chair of the firm’s Commercial Transactions practice group, Surinder has been repeatedly named a Leading Lawyer by IFLR1000, and ranked among General Business Law attorneys nationally by Chambers Global. 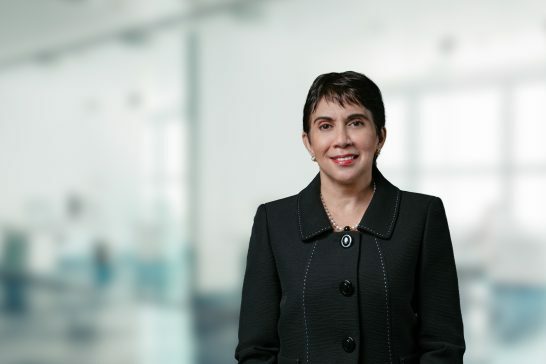 She was named Lawyer of the Year in 2014 by Terralex, a global network of independent law firms, where she is a former Director Emeritus, having spent ten years as a director and nine years as regional co-chair of the Central American and Caribbean Region. Surinder earned an LL.B. (Hons) degree from the University of Buckingham, England in 1983, and was admitted to the Bar of England and Wales in 1984. The following year, she was called to the Bar in her native Malaysia. In 1995 she was called to the Bahamas Bar, when she became a citizen of The Bahamas. She is a member of both the Bahamas Bar Association and the International Bar Association. She is a qualified Trust and Estate Practitioner (TEP). Surinder is fluent in English and has conversational Bahasa Malaysia. Acted as legal advisor for the statutory body mandated to oversee the principal airport in the country (including dealing with amendments with the relevant statute) in connection with financing the expansion of the airport. Acted as legal advisor to an international oil and gas company in connection with the sale of its oil refinery and storage tanks. Acted as legal advisor to an international oil and gas company in the sale of the shares of its Bahamian subsidiary, which was a national petroleum products wholesaler and retailer. Acted as legal advisor to a buyer of all of the issued shares of a utility company and in the subsequent sale thereof, including related financing. Acted as legal advisor to a lender in connection with credit facilities secured by encumbrances over vessels and other assets of the borrower and other companies in the group. Acted as legal advisor to a multinational financial institution regarding a sovereign loan to The Bahamas. Acted as legal advisor to a US based pharmaceutical company in the formation of a Bahamian company and in its acquisition of a pharmaceutical manufacturing plant, including related financing. Acted in the privatization of a Government owned utility. Acted in the privatization of a commercial port. Acted for lender in the realization of security involving the sale of a group of companies involved in retail grocery business. Acted as legal advisor to a Bahamas-based brewing, beverage distribution and retailing company with a highly recognizable portfolio of beverages in connection with its IPO. Acted as legal advisor to two multinational banks in connection with the sale and purchase of the business and assets of one of the banks to the other. Acted as legal advisor to a multinational bank in connection with the sale of its consumer loan portfolio. Acted as legal advisor a Brazilian bank in connection with the establishment of a branch in The Bahamas. Acted as legal advisor to internationally renowned hospitality brands in connection with their franchising agreements in respect of local hotels. Acted as legal advisor to an international hospitality company in connection with its real estate development project in The Bahamas including its gaming licence. Well regarded by her peers in the transactional arena… acting on many high-value IPOs, joint ventures and structured finance deals.